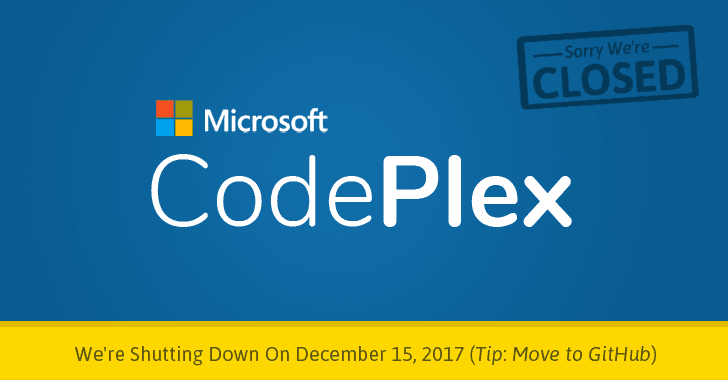 Microsoft has announced to shut down CodePlex -- its website for hosting repositories of open-source software projects -- on December 15, 2017. Launched in 2006, CodePlex was one of the Microsoft's biggest steps towards the world of open source community -- where any programmer, anywhere can share the code for their software or download and tweak the code to their liking. However, Microsoft says that the service has dramatically fallen in usage and that fewer than 350 projects seeing a source code commit over the last 30 days, pointing to GitHub as the "de-facto place for open source sharing." In a blog post published Friday, Microsoft Corporate VP Brian Harry wrote that the shutdown of CodePlex is because the open source community has almost entirely moved over to GitHub, which provides similar functionality for sharing code that people can collaborate on. "Over the years, we have seen a lot of amazing options come and go but at this point, GitHub is the de-facto place for open source sharing, and most open source projects have migrated there," says Harry. According to the company, Github has become the "Facebook for programmers," so "it's time to say goodbye to CodePlex." For now, Microsoft has disabled the ability to create new projects on CodePlex, and in October the site will be turned into a read-only archive. The complete shutdown comes on December 15 this year, at which point the CodePlex website will be archived indefinitely. "You will also be able to download an archive file with your project contents, all in common, transferable formats like Markdown and JSON," Harry writes. "Where possible, we will put in place redirects so that existing URLs work, or at least redirect you to the project's new homepage on the archive. And, the archive will respect your "I've moved" setting, if you used it, to direct users to the current home of your project." Harry also points out that many of Microsoft's open source software projects have already found their way to GitHub and the company is actively recommending people to do so. Microsoft is making the process of migration easier for its users. Microsoft has teamed up with GitHub to create a "streamlined" migration tool to help developers shift their code and related content over to GitHub. Since a release date of the migration tool is not yet known, users can check out the guide on CodePlex for any help with migrating to GitHub.